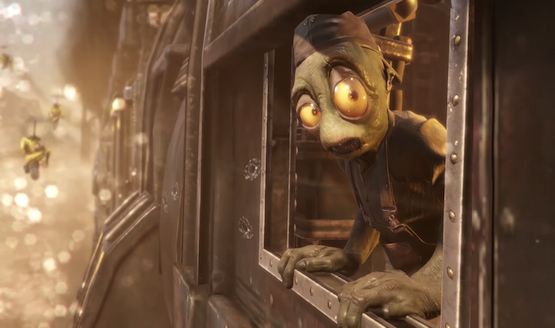 Oddworld Inhabitants gave people a new and tasty look at Oddworld: Soulstorm during the Unity GDC keynote today, highlighting their stunning in-game engine. The aim of the teaser, according to the video’s description, was to give “a glimpse of a cinematic showing off the rendering techniques,” and man, does it impress. You can watch the trailer here. People may find the facial animation, the movement of the train, and the detailed environment is impressive for an independent title. For Soulstorm, we wanted to break new ground, [and] big visual and cinematic leaps were important to us. And so as a storyteller, I need to stay focused on the things that bring that narrative to life and in this case, this is where Unity’s real time lighting and technologies, and the amazing teams working with us around the world are making this possible. No release date or platforms for Oddworld: Soulstorm have been given for the game yet. However, we do know the concept for the story, which takes place straight after Oddworld: New ‘n Tasty, a remake of Abe’s Oddysee. Our unorthodox hero Abe has defeated Molluck The Glukkon, RuptureFarm’s horrible meat plant executive and has thwarted his plans to turn his fellow Mudokon slaves into food. However, after the escape of 300 factory workers, they’re without food, water, and shelter in the desert. There is a drink that might keep them alive, but something doesn’t seem right. It is up to players to help Abe and the people he has saved survive and not get sucked into another perilous sort of trap. Are you ready for another trip into Oddworld? Let us know!